The Publix on SR 60 in Valrico opened in early September. At 8 a.m. on opening day, close to 100 people waited in line to see the new 54,000 sq.ft. Publix in Valrico. It has been more than a year of watching the relocation from across State Road 60 and the frame-by-frame building of the expanded and enhanced location. Anchoring the Valrico Commons Shopping Center, the new Publix sits just behind Applebees and Hardees at 1971 S.R. 60 E., just before Valrico Rd. It not only brings a bigger store to the Valrico community, but also opens with a new design concept mirrored only by one other store in Naples. Plant City resident Miriam Chazares whose three children attend Nativity Catholic School had only recently found out about the new store and gave in to curiosity. Her first word, “Huge,” she said, impressed with the size and spaciousness of the floor plan. It makes you feel like you are in an open market and its nice,” she added. A concept, Shannon Patten, media and community relations’ manager for Publix, said was intentional. The first encounter upon entering is of the produce, bakery and flowers. The merchandise tables were stocked in a cascading effect and organized to encourage easy browsing. Being from Peru, Chazares was equally impressed with the Ethnic food section, the first store she’s encountered that actually sells Peruvian products. The expansive store boasts 15 rows of products and 10 registers with the express lanes conveniently located right in front of the doors. Greenwise, the natural and organic products are now integrated with products of the same category and are marked by curved out shelves, known as radio shelving, for easy spotting. There is also a Gluten Free food section after many requests from shoppers. The deli section will have four fresh soups daily at the new soup bar as well as an olive bar with a wide selection of olives. Valrico resident Rosy Grindel was one of the first to enter and receive the first few hundred customer tokens; a Publix stamped rose, and insulated Publix bag from the store’s manager, Andy Heavenridge and accompanying staff. “We’ve been waiting for a long time,” she expressed, pleased with her findings near the dairy section. “It’s great,” she added. Store Manager Andy Heavenbridge (l) and Assistant Manager John Wenworth both started at Publix as service clerks ‘baggers’, now they spend the morning welcoming the Valrico community into the new 54,000 sq.ft. Publix. Publix saw many merchandise representatives there to celebrate the opening, like Blue Bell ice cream and Frito Lays, who brought along Chester the Cheetah. Local high school band members from Durant also showed their support and greeted the guests with live band music. Within the first hour, Publix saw more than 500 customers enter and enjoy the new store. 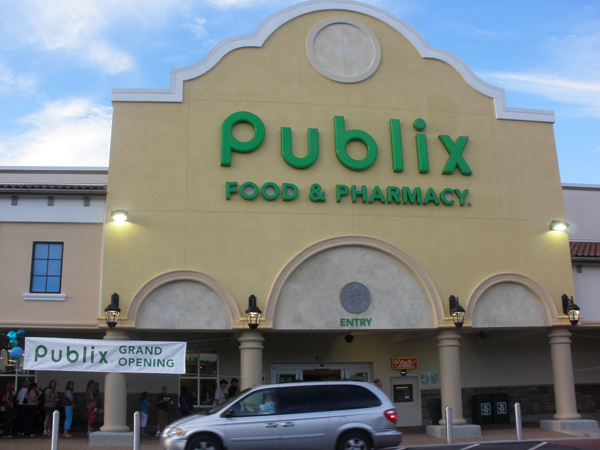 The new Publix store hours are Monday-Sunday 8 a.m.-10 p.m. For more information call 657-4041. Adjacent to this location is also a 1,800 sq. ft. Publix Liquors. This stand-along liquor store offers a full-line of beer, wine and spirits. It is open Monday-Saturday 10 a.m.-9 p.m. and Sunday 11 a.m.-8 p.m.